BEAVERTON, OREGON – Without proper planning, industrial control panel labeling for a new facility or one that is updating and upgrading can be a daunting task. To help facility managers maximize productivity and boost communication and hazard prevention, Graphic Products, a global leader in visual communication solutions for compliance and safety, introduces a free guide to Industrial Control Panel Labeling. This guide bundles safety information and compliance labeling solutions for easy management and maintenance of industrial control panels. Graphic Products is an innovative leader, providing solutions for safety and visual communication since 1970. The company’s full line of safety products, services, and DuraLabel line of industrial label and sign printers are designed for the modern workforce. 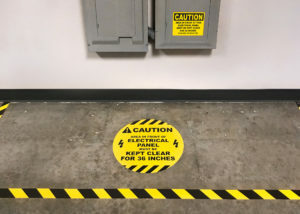 Graphic Products leads the industry with safety training materials, educational resources, and up-to-date news and compliance information on industrial topics that include floor marking, chemical labeling, and 5S. Visit www.GraphicProducts.com or call 800.788.5572.